Welcome to our apparel round-up. It’s a one-stop shop for flash sales, deals, promo codes and (god forbid) even rebates. Here, I prowl the Internet for the best offers on everything from snow boots to hoodies. Please let me know in the comments what you bought, so I can live vicariously through you. 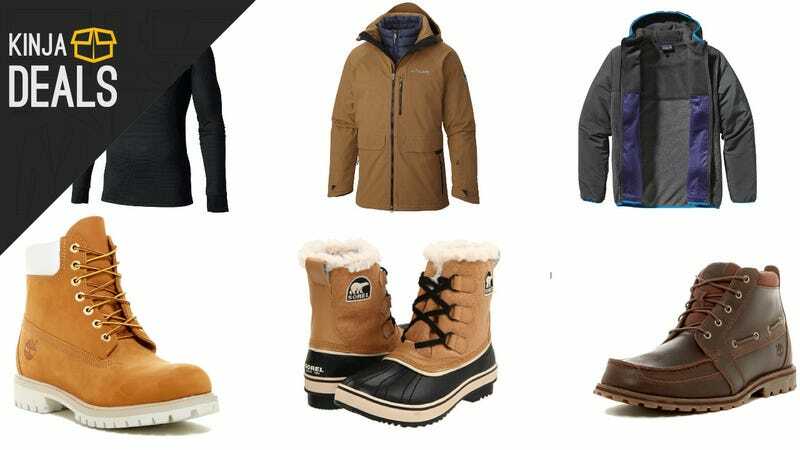 Today, you’ll find some superb deals on Uniqlo fleece, Patagonia down jackets, Columbia winter gloves, and sturdy Sorel boots. Commerce Content is independent of Editorial and Advertising, and if you buy something through our posts, we may get a small share of the sale. Click here to learn more. We want your feedback. Uniqlo, a beloved Japanese export, is offering their fleece-lined wares at a discount. If you mosey on over, you’ll find jackets, hoodies, and even long johns. Over at Nordstorm Rack, there’s a big ol’ selection of Timberland shoes at downright indecent prices—The classic boot is 47% off, while others are up to 43% off. Trust me, you’ll want to peruse the entire selection. Your winter prayers have been answered: Patagonia’s 30% sale has arrived. From storied synchilla sweaters to a down parka, you’ll find an abundance of warm winter deals. Despite its reputation, Banana Republic consistently churns out sophisticated, playful designs—at a modest price, of course. Today, all sale items are reduced by 50%. As far as I’m concerned, Sorel boots are nothing short of witchcraft and, according to this Kinja Co-Op, most of you agree. If you’re in the market for winter boots that will outlive your grandchildren, do head on over to their massive clearance sale. What&apos;s The Perfect Winter Boot? Columbia needs no introduction, since you (or someone within direct eyesight) has likely purchased one of their wares in the last year. And right now, you’ll find their most beloved items at a deep discount. We highly recommend taking a peek at the full selection.